Europe�s central banks are $40bn poorer than they might have been after they followed a British move taken 10 years ago on Thursday to shrink the Bank of England�s gold reserves, analysis by the Financial Times has shown. London�s announcement on May 7 1999 that it would sell a large share of the Bank�s gold reserves in favour of assets offering a return, such as government bonds, was the high water mark of so-called anti-gold sentiment among European central banks. Many of these banks, such as those in France, Spain, the Netherlands and Portugal, decided later in 1999 to follow Britain and sell off their reserves. At that time, gold was worth around $280 an ounce, less than a third of its current level of more than $900. 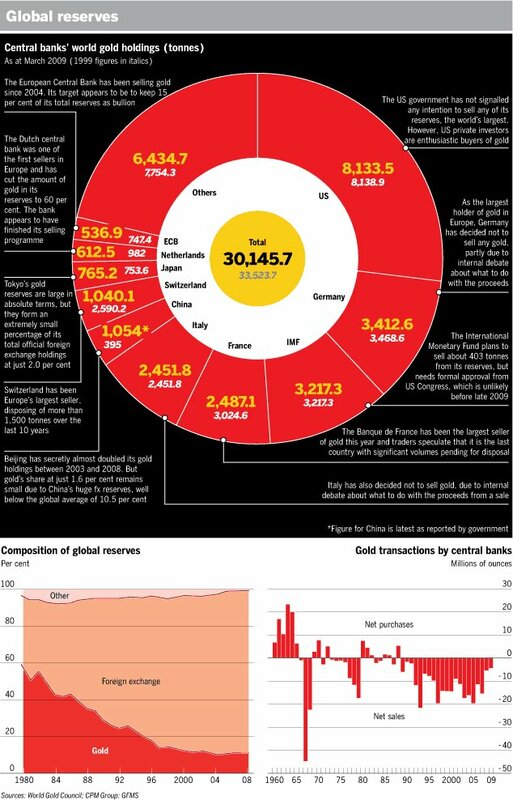 European banks sold about 3,800 tonnes of gold, reaping about $56bn, according to calculations from official sales data and bullion prices. Taking into account the likely returns from the investments in bonds, the banks have gained another $12bn. But because today�s gold prices are far higher, they are about $40bn poorer than if they had kept their reserves. The biggest loser is the Swiss National Bank which sold 1,550 tonnes over the decade and at today�s gold prices is $19bn poorer, followed by the Bank of England, which is $5bn poorer. The UK Treasury on Wednesday defended its decision to sell gold as a way to diversify reserves and cut risk. As a result of the program, a one-off reduction in risk of approximately 30 per cent was achieved, it said. The Swiss National Bank declined to comment other than to say that it did not plan to sell more gold. However, central bankers are confident that over the long run their move out of gold and into bonds will pay off and reduce the volatility of their portfolios, people familiar with their thinking said. Analysts also argue that because some banks had more than 90 per cent of their assets in gold, some disposals were warranted. The proportion of European reserves held as gold remains extremely large even after years of sales, at an average of about 60 percent, compared with the world average of 10.5 percent. After 10 years of steady sales, Europe�s gold sales are set to slow to their lowest levels since 1999, while central banks outside Europe have already become net buyers of gold. The US, the world�s biggest holder of gold, decided not to follow Europe�s move. Germany and Italy are the only two big European central banks which did not follow the UK, mostly because of domestic disputes about what to do with the proceeds.